Vicente Amigo. Credit SRO Artists. 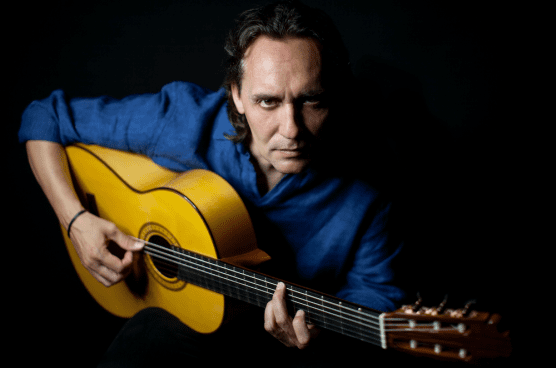 Vincente Amigo, the “technically stunning and emotionally free-flowing” (The Seattle Times) Flamenco guitarist will give a rare Southern California performance on Wednesday, Oct. 17 at the Younes and Soraya Nazarian Center for the Performing Arts (The Soraya). Hailing from Córdoba, Spain, Amigo is the most dazzling Flamenco guitarist of his generation. He started studying guitar at age eight with maestros El Merengue (Rafael Rodríguez Fernández) and El Tomate (Juan Muñoz Expósito) and launched a career onto major stages while still a teenager. “I play guitar because when I was 3 years old, I saw Paco de Lucía on TV and it stayed with me,” he recalled. Amigo has received multiple Latin Grammy Awards and his nation’s most important honor, the “Patriarch of Flamenco” Award at the 2010 Flamenco Summit. Single tickets for Vicente Amigo, beginning at $34, are now available. For more information or to purchase tickets, visit www.TheSoraya.org or call 818-677-3000. Younes and Soraya Nazarian Center for the Performing Arts is located at 18111 Nordhoff Street, Northridge, CA 91330. Ticket prices subject to change. Since winning the Latin Grammy Award in 2001, Amigo has gone on to expand flamenco’s influence and versatility while still honoring its roots. His 2013 album, Tierra is composed entirely by Amigo with music that fuses Spanish and Celtic traditions-debuted at Celtic Connections in Glasgow in 2013. Born in Guadalcanal, a small village in Seville, Spain, on March 25th, 1967, Vicente Amigo Girol actually grew up and lives in Córdoba, also in Andalusia. He started studying guitar when he was eight with maestros such as El Merengue (Rafael Rodríguez Fernández) and El Tomate (Juan Muñoz Expósito) and at 15 he became an apprentice of the great Manolo Sanlúcar, in whose group he worked for several years. He appears in Sanlúcar’s masterpiece Tauromagia (1988), considered one of the most important flamenco albums of all time. He gained early recognition while accompanying singer El Pele (Manuel Moreno Maya), with whom he recorded “Poeta de Esquinas Blandas” (1988). That same year, Amigo also launched his solo career. Soon, he built an international reputation as he performed with Camarón de la Isla, arguably the most important singer in modern flamenco history, but also with artists such as John McLaughlin, Al Di Meola, Brazilian singer and songwriter Milton Nascimento, and Spanish pop superstar Alejandro Sanz. He won several flamenco guitar prizes and appeared at Leyendas de la Guitarra (Legends of the Guitar), an international event celebrated in Spain that served as a preview of the Seville Expo in 1992, representing flamenco with Paco de Lucía, the decisive figure in modern flamenco guitar. De Lucia, who passed away on in February, 2014, became a lifelong friend and admirer. Those who set out sports-like comparisons or are eager to bestow the unwanted mantle of “the next Paco de Lucia” fail to grasp the depth of their relationship, which is underscored by the fact that they became compadres, godfathers to each other´s children: Amigo to De Lucia’s daughter Antonia; De Lucia to Amigo’s youngest son, Marcos. “Such is life. I play guitar because when I was three years old I saw Paco de Lucia on TV and it stayed with me,” recalls Amigo. “Later we became friends and shared many great times. For all flamencos, Paco is the greatest. He opened paths. He did so much for flamenco guitar that we are all indebted to him.”. Given his elegant, melodic style it’s no surprise that he has been especially adept at writing for, and working with, singers, including the great Enrique Morente (who recorded several of Amigo’s songs), his daughter, Estrella Morente, Carmen Linares and Diego El Cigala within the flamenco tradition, but also with artists such as Sting (on “Send Your Love” from Sting’s Sacred Love), and Brazilian jazz pianist and vocalist Eliane Elias outside it. He has also stretched out, contributing his playing, writing and production ideas to flamenco singers José Mercé ( on Del Amanecer) and Remedios Amaya (Me Voy Contigo). Still, while clearly rooted in flamenco, Amigo set out early on to explore the possibilities of fusions in both his recordings and collaborations. In the remarkable Poeta (1997), he paid tribute to the poetry of Rafael Alberti with a work for guitar and orchestra featuring Cuban guitarist, composer and conductor Leo Brower and pop star Miguel Bosé, who collaborated reciting the texts. Then, in his Paseo de Gracia (2009), named after a street in Barcelona, he explored pop music, calling on the Morentes and Sanz. And in the expansive Ciudad de Las Ideas (City of Ideas), Amigo collaborated with Argentine pop rocker Pedro Aznar and Algerian rai star Khaled. Tierra, his seventh release, features all music composed by Amigo and arranged by him and Dire Straits keyboardist Guy Fletcher. It was recorded in London with members of Mark Knopfler’s band and the Scottish folk group Capercaillie. As his eighth studio record, Memoria de los Sentidos, Vicente Amigo is back to his traditional flamenco roots. In this album he has gathered the top active flamenco artists, as Potito, El Pele, Miguel Poveda, Pedro el Granaino, Niña Pastori and even Farruquito, with his incredible dance and “zapateao” on Vicente´s buleria. Four years after his last album Tierra, and recently awarded with the Gold Medal of the Fine Arts by the Spanish government Vicente Amigo is back with his most traditional flamenco album, the class of flamenco which is felt and expressed by very few artists. Through his new album we could listen and enjoy themes like Requiem, an overwhelming tribute to his master, Paco de Lucia. Vicente also experiments with a Seguriya and Tientos, two traditional “Palos” from Flamenco music which he has never recorded in. A transcendent performer, composer and producer, Amigo burst onto the major stages of flamenco while still a teenager. Since then, he has earned a shelf full of awards, including a Latin GRAMMY® for Ciudad de Las Ideas (City of Ideas) in 2001. The 2018-19 Season marks the eighth year the award-winning Younes and Soraya Nazarian Center for the Performing Arts which has quickly become one of the cultural jewels of the greater Los Angeles region. Under the leadership of Executive Director Thor Steingraber, The Soraya continues to expand its programming and outstanding multidisciplinary performances. The mission of The Soraya is to present a wide variety of performances that not only includes new and original work from the Los Angeles region but also work from around the world that appeal to all of LA’s rich and diverse communities. Date: Wednesday, Oct. 17, 7:00 p.m.
Prices: Starting at $34. Prices subject to change.